Mercury pollution has risen nearly 50-fold in the feathers of a breed of Arctic bird over the past 130 years, say scientists. Analysis of museum specimens shows high mercury levels in the endangered ivory gull. It could have implications for the bird's ability to reproduce and raise chicks, says a Canadian team. Mercury levels are going up in other Arctic birds, fish and mammals, due to atmospheric pollution, they report. 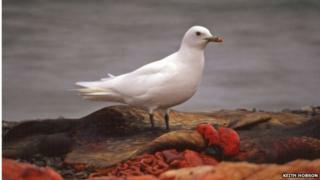 Biologists at the University of Saskatchewan, Canada, say the ivory gull (Pagophila eburnea) acts like a "mercury barometer", sounding alarm bells for contamination of Arctic animals with mercury pollution. "We're concerned because the mercury's going up but their diet hasn't changed over the 130 years we've studied," lead researcher, Dr Alex Bond, told BBC News. "This is a genuine increase - it's gone up 45 times, which is twice the average for an animal species in the Arctic." Mercury in the atmosphere comes from natural sources such as volcanoes, as well as human activities like coal burning. Air currents can transport mercury to the Arctic from mid-latitudes in just a few days. "A reduction in atmospheric mercury would be key - this is probably where much of it is coming from - and that would come by burning less coal," said Dr Bond. The researchers analysed museum feather samples of the ivory gull from the Canadian Arctic and western Greenland from 1877 to 2007. They found the bird had been exposed to mercury for decades, from scavenging on the carcasses of whales, seals and other mammals killed by predators such as polar bears. The gull is endangered in Canada, where numbers have declined by 80% since the 1980s. Elsewhere, it is classified as near-threatened by the International Union for Conservation of Nature. Rises in mercury levels could be due in part to this decline, as well as factors such as hunting and changes in the sea ice, the researchers reported in the journal, Proceedings of the Royal Society of London B- Biological Sciences. The avian's eggs have the highest concentration of mercury of any Arctic bird. "We figure in the next 50 to 70 years, we're going to see deleterious effects such as reduced reproduction and an inability to forage or find a mate or raise a chick every year," said Dr Bond. There is concern about mercury pollution in the ivory gull in particular, but also in other species high on the food chain, where greater concentrations of mercury accumulate in animals' bodies. Mercury levels are rising in fish such as the burbot, the ringed seal and the beluga whale. The Minamata Convention on Mercury is a global treaty to protect human health and the environment from the adverse effects of mercury, which has been signed by 94 countries. It includes a ban on new mercury mines, the phasing out of existing ones and control measures on emissions from power stations. Rod Downie, Polar Programme Manager at WWF UK, said: "This is further clear evidence of the global and circumpolar impacts of human activity on Arctic wildlife, which is already stressed by the most pronounced climate change on Earth. "Action is needed to reduce contaminants from entering Arctic ecosystems, as required under existing international conventions, and to urgently tackle climate change." Full details of the research are published here: Rapidly increasing methyl mercury in endangered ivory gull (Pagophila eburnea) feathers over a 130 year record - Proceedings of the Royal Society of London B- Biological Sciences.